Fracture and mechanical stratigraphy investigates the role played by a rock multi-layer on the brittle deformation mechanisms. By mean of detailed multidisciplinary analyses, we investigate the control exerted by sedimentological and diagenetic factors on the following processes: (i) preservation/modification of pore network characteristics (i.e. pore type, size, and distribution), (ii) principal failure modes (i.e. opening-mode deformation), and (iii) fractures distribution across the investigated multi-layers. 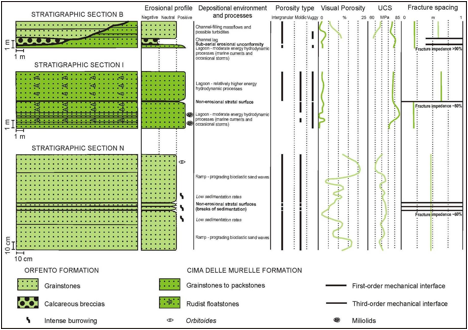 - to develop a comprehensive facies scheme and to provide a detailed reconstruction of the stratigraphic architecture of the studied rocks.